Sunday, February 29, 2004: Mark the date. 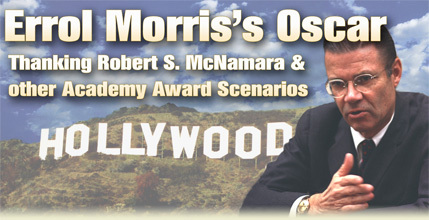 That night, at the 76th Annual Academy Awards, we'll finally know the answer to the question on every Academy member's lips: During Errol Morris’ Oscar acceptance speech for his film The Fog of War: Eleven Lessons from the Life of Robert S. McNamara, will Morris thank McNamara? Morris, of course, has yet to be nominated. But on January 27th, when the nominees are announced at the Samuel Goldwyn Theater, that will change. (It did.) Morris is due. The fact that he's never been nominated before, will be a plus. After all, the Academy is always a little behind the curve when it comes to recognizing artistic genius and Morris has already directed a string of masterpieces, including Thin Blue Line, A Brief History of Time, Fast, Cheap and Out of Control, and Mr. Death. The nomination will be a breeze. The award: a shoo-in. Speaking of out of control, “McNamara’s story is about things slipping out of control,” Morris said in an interview on Weekly Signals — a KUCI radio show I co-host with Mike Kaspar. "This close to what?" Billy Crystal, our host might ask. To nuclear annihilation, of course. You remember don't you? Weapons of Mass Destruction aren't new. We invented them and McNamara came "this close" to using them. The fact that he was one of the best and brightest of his generation — President of Ford Motor Company and Secretary of Defense under Presidents Kennedy and Johnson — didn't matter. According to McNamara himself, the only thing that prevented the unspeakable from happening (not only the end of the world, but no Oscar for Lawrence of Arabia) — was pure dumb luck. "Luck" is a word you don't often hear in the telling of history. So how did Morris tell McNamara's story? And so he did. McNamara is essentially the only voice in the film, teaching us lessons summarized in a Tao de Ching-like litany. 1. Empathize with your enemy. 2. Rationality will not save us. 3. There’s something beyond one’s self. 5. Proportionality should be a guideline in war. 7. Belief and seeing are both often wrong. 8. Be prepared to re-examine your reasoning. 9. In order to do good, you may have to engage in evil. 11. You can’t change human nature. “I started this before 911,” Morris said. “And what horrifies me is that every month we continued to work on the movie, it seemed to become more and more relevant to the present time. It was as if we were re-enacting the mistakes of fifty years ago all over again. And that’s not very encouraging. I wonder, will Morris drop Colin Powell’s name at the awards ceremony? Will he do "Michael Moore" and draw a parallel between McNamara’s Vietnam and Powell’s Iraq? Will he hold Oscar over his head and say “Rationality will not save us?” Or will Morris, an anti-war protestor in the 1960s, ask Powell and McNamara for an apology? Probably not. "At a certain point I ask myself, 'Do I want to hear McNamara apologize?’” Morris said. “What would it mean? 58,000 Americans died in the war in Vietnam — between 2 and 3 million Vietnamese. What does it mean for a man to say 'I'm sorry this happened?' Perhaps his enterprise of trying to figure out how it happened is a more valuable one — a more important one. I'm not sure." Neither am I. If we all get vaporized in a mushroom cloud what would it mean for someone to say "I'm sorry this happened?" But enough existential dread. Let’s get back to more important things. Will Morris thank McNamara when he accepts the Oscar? Maybe. If we're all still around.